Since the company’s inception a dozen or so years ago, Gunboat’s no-holds-barred Morrelli & Melvin-designed boats, with their distinctive angular slab-sided hulls, have become the ultimate objects of desire for a whole generation of multihull sailors. Since the company’s inception a dozen or so years ago, Gunboat’s no-holds-barred Morrelli & Melvin-designed boats, with their distinctive angular slab-sided hulls, have become the ultimate objects of desire for a whole generation of multihull sailors. Moving now into the next phase of its existence, with a new wave of boats designed by Nigel Irens, Gunboat is certainly not resting on its laurels. The new Gunboat 60, while echoing key features of its predecessors, not only embodies a new aesthetic—with subtle curves, a graceful reverse sheer line, a hull chine and reverse destroyer bows—it also pushes the envelope in terms of systems and technology. As with previous Gunboats, this new boat’s construction is of top-flight raceboat quality. The hull laminate is carbon fiber set in epoxy resin, fully infused and post-cured over a CoreCell foam core. All interior furniture and components are likewise foam-cored and are skinned with fine wood veneers. 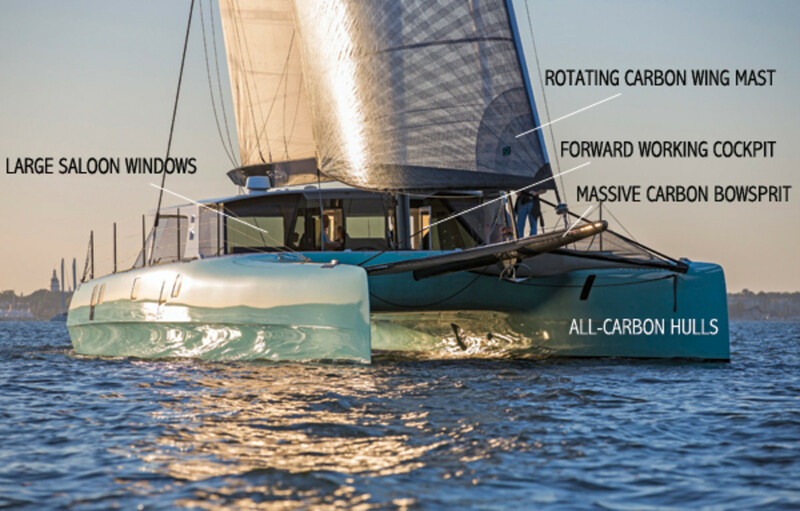 The boat’s carbon rig features a Marstrom rotating wing-section mast supported by aramid fiber rigging. Furling gear is from Facnor. 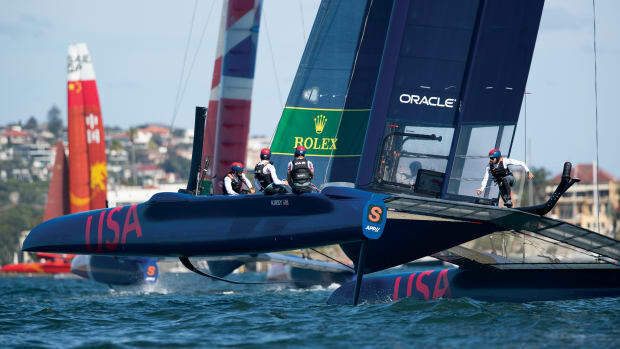 The underwater foils—centerboards instead of daggerboards, to improve crash-worthiness—are also carbon, as are the rudders, which are retractable. The centerboards are controlled by hydraulic rams, with shear pins that let the boards kick up on impact. 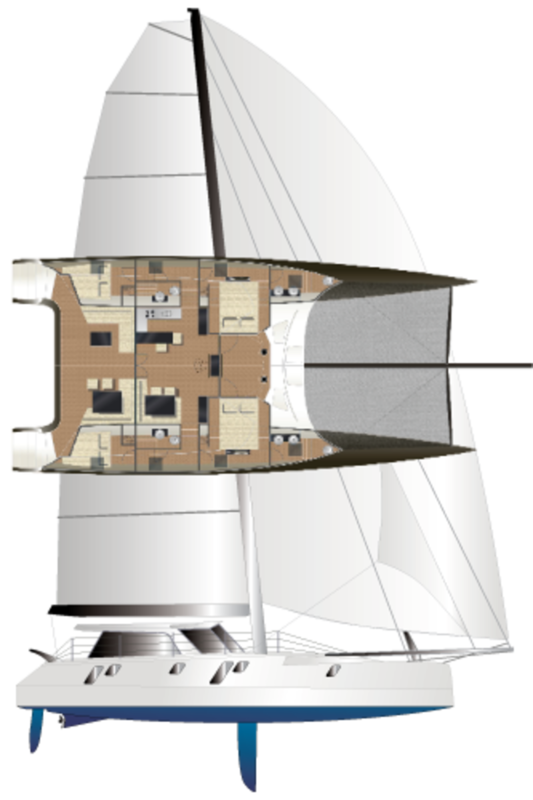 The hull design is uncompromising, with narrow hulls, a high bridgedeck, and nothing forward of the mast but trampolines and a massive carbon bowsprit. The hulls and bridgedeck are one piece, with no major structural beam forward. Gunboat’s trademark forward working cockpit, just abaft the mast and forward of the cabinhouse, is retained in this 60-footer. All working lines are led here, to a battery of three Lewmar power winches, so the boat can be easily controlled from this one spot by a small crew. There are two custom carbon wheels from Edson sharing a single axle: one is immediately in front of the house, the other is just inside, behind an elegant control pedestal. Instinctively one tends to use the inside wheel, as you can stand behind it and still easily see both the headsail telltales and the mainsail through two large deck hatches overhead. 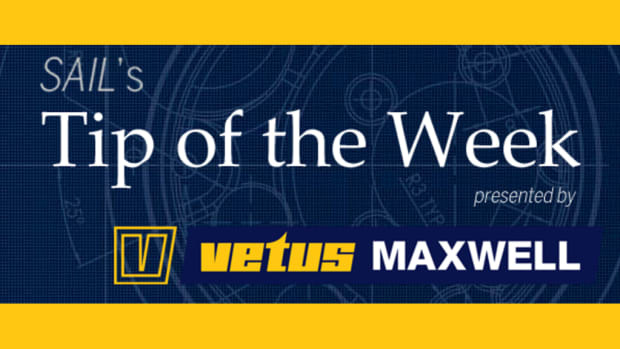 The hydraulic mainsheet controls, including one button that instantly releases the sheet, are immediately at hand. The inside helm station also affords a clear view of a B&G Zeus chartplotter with radar. Behind the house aft there is a large lounging cockpit. It features a series of three settees, two of which are ranged around tables, with a larger dining table to port, where food can be easily handed out through a window from the galley. To starboard a Southern Stainless electric barbecue is built into the coaming, cleverly hidden under a hatch cover. Tender davits on the stern are equipped with a Lewmar captive-reel winch. Interior space for a boat this size is somewhat limited, due to the aggressive hull configuration, but is not cramped. 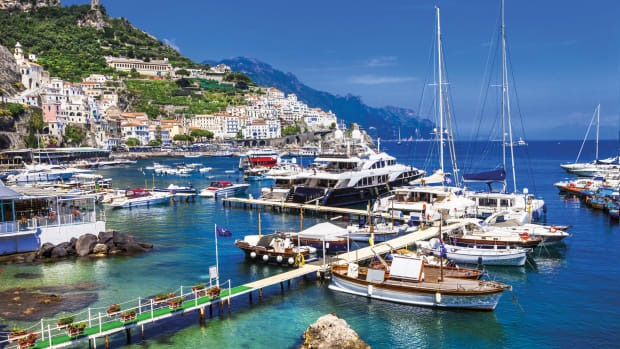 The layout boasts four double-berth staterooms, plus crew quarters forward to port with two single berths. This space can also be used as a workroom and is accessed through either the deck or from inside the hull. The midship staterooms have their island berths oriented athwartships, with step-up access on both sides. In the smaller aft staterooms, the berths are in line and span the hulls. All staterooms enjoy lots of natural light through various hull ports and deck hatches. The bridgedeck saloon, with a spacious galley to port and a dinette area to starboard, is enclosed by large windows. With the two aft windows and the aft door and two forward doors all flung open, the space is so well ventilated as to be effectively outdoors. The galley is superbly appointed, with plenty of working counter space and an array of modern appliances—including a large four-drawer Arctic Air fridge and freezer system, and a Bosch ceramic range top and induction oven. An AquaWhisper 600 gpd watermaker keeps the boat’s freshwater supplies topped up. The interior design throughout is what I’d call “understated luxury,” with lots of Ultra-Leather upholstery and tasteful wood trim. The standard choices are teak, cherry, makore or sapele. 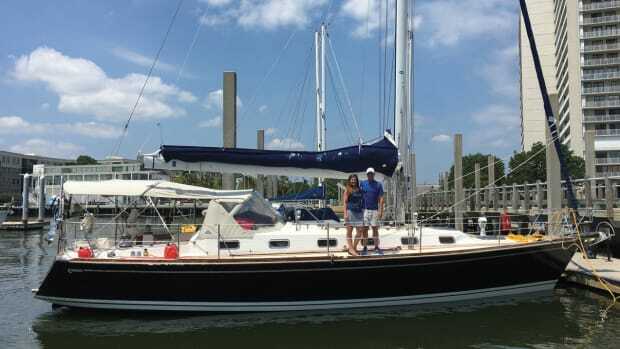 Gunboats are renowned for their sailing performance, and this new boat certainly does not disappoint in that regard. 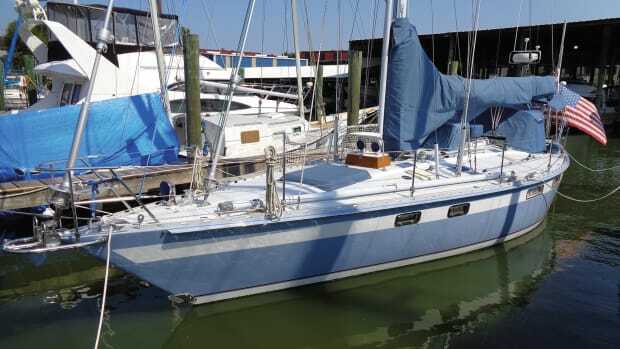 We had very little wind during our test on Chesapeake Bay—about 5 knots true—but had no trouble getting the boat moving. Sailing upwind under a big carbon screecher from the Quantum sail loft we made 6-plus knots at a 40-degree true wind angle. Downwind under an A-sail at a 120-degree TWA we made the same speed in just 4 knots of true wind. When the breeze gusted up to over 7 knots, these speeds increased to 7.5 and 8 knots respectively. In a proper breeze, obviously, you can easily get this boat sailing at double-digit speeds. Gunboat boasts that its boats are powerful enough to click off 300-mile days on passage, and they’re not kidding. The record 24-hour run for a Gunboat, a 66, is 427 miles. 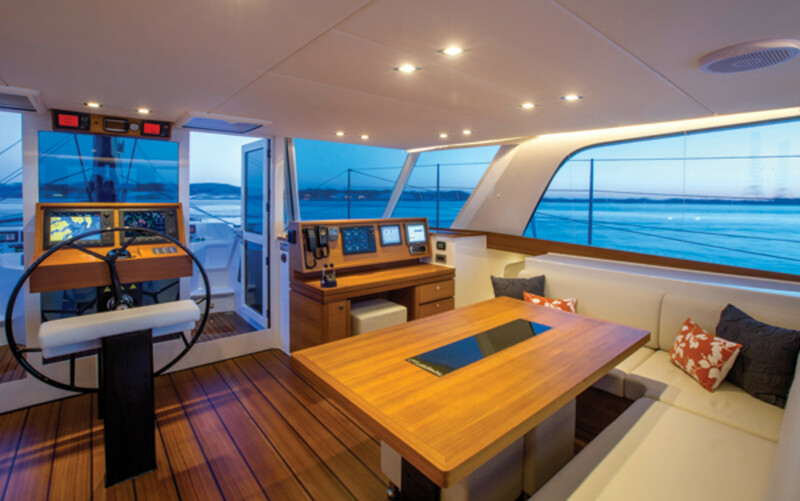 Equally impressive on the Gunboat 60 is the technology used to control this power. The rig on our test boat was equipped with digital load sensors, so that all working loads can be monitored in real times while sailing. To keep the boat from capsizing—or, if you prefer, from flying a hull, which is a distinct possibility—the sheets can be set to release automatically when rig loads hit pre-set limits. With the mainsheet, this is done hydraulically.  With headsail sheets, it is done electrically, as the cam cleats for those sheets have switches that let them flick up and cast off their lines when the auto-release system is activated. With controls like this, even the most conservative owner can press the boat hard without having to worry about worst-case scenarios. More impressive yet is the Gunboat 60’s optional cutting-edge PowerWave hybrid propulsion system, which recently won a SAIL Best Boats systems award. Two 20kW electric motors turning propellers on fully retractable drive legs are what keep the boat moving when the sails are down, and these pull power from a large 29kWh lithium-ion battery pack. 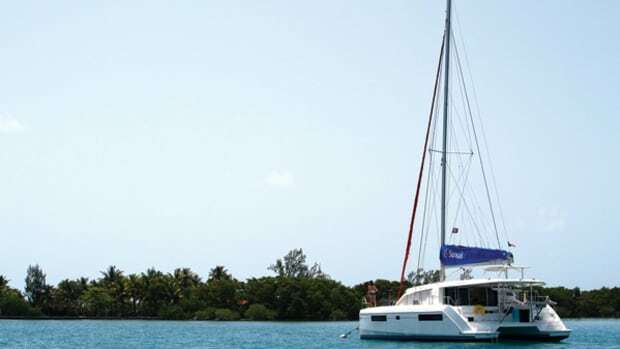 The battery, in turn, is fed by a 1kW solar system, by freewheeling props when the boat is sailing, and, finally, a pair of 22kW DC generators. The electric motors can push the boat at speeds up to 9 knots, but can only run flat out for about 30 minutes before the generators kick in. Maneuvering at much slower speeds, the battery pack can last hours without support. Ultimately, the boat is so agile under sail you likely would rarely need to run the motors for very long. If, however, you want a traditional propulsion system, the boat can also be ordered with standard diesel engines. This may be the best Gunboat yet, which is saying a lot. 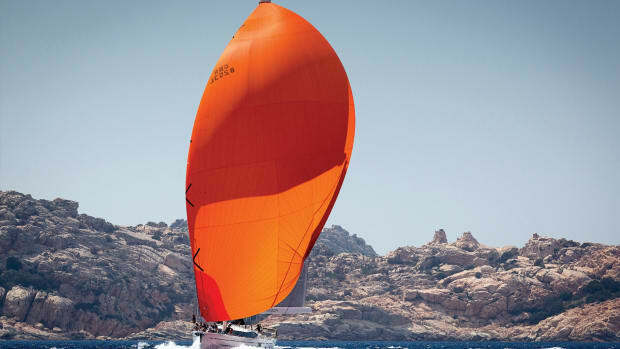 It’s more stylish than its predecessors, sails just as well (or better), and can be packed with cutting-edge technology that is well thought out and carefully engineered.